Uber-cool Chrysler crinkle black air cleaner with ginormous K&N filter. 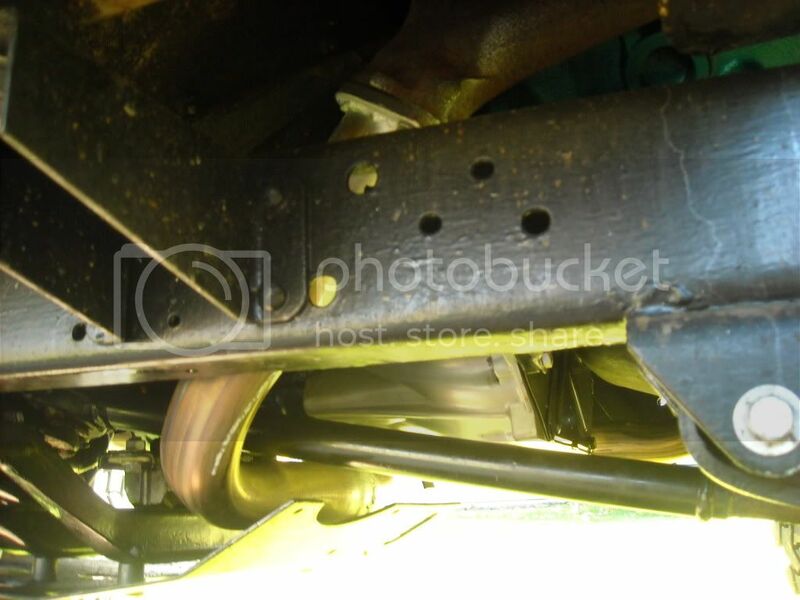 This shows crossover pipe passing from passenger side across and over the skid plate but under the front driveshaft. With front axle at full sag there is still plenty of clearance. Pipes are stainless. 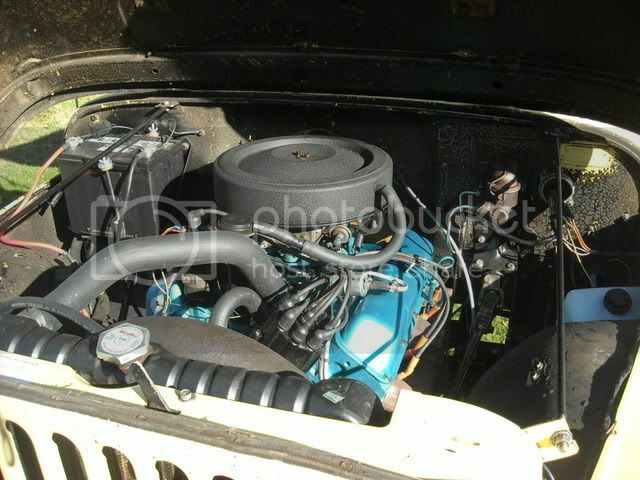 Heres the 2-into-1 with Flowmaster 44 Delta behind it. I like that the flowmasters don't have packing to retain engine moisture and rot out from the inside. Sounds good and it's super durable. 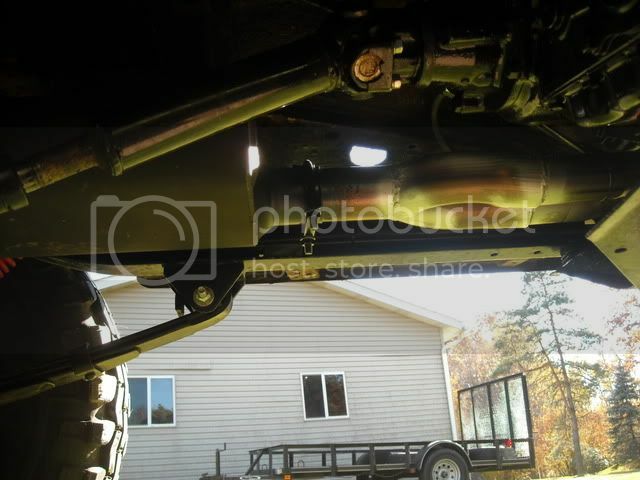 The muffler shop did a nice job of tucking it up high and flat. This view shows the high exit behind the left tire. Nice,,,and unique looking rig,,enjoy it. The SuperJeep scheme took a while for me to warm up to. Definitely diifferent but I like it now. Cool Jeep! There is a place selling reproduction decals if you decide to repaint it. Theres a white Super Jeep in the next town over from us. You gotta get one of those mullet wigs to wear when you drive that! That thing rocks! Nice. There's a super here in town the same colors. Open rear D44, for now. Lockright or Detroit soon. C'mon, guys. A mullet is way too modern for my rig. If I had a 1988 IROC I'd be all over a mullet, a pair of Converse Cons (with the big flourescent green laces, untied of course), parachute pants, two polo shirts with both collars up, maybe a bandana tied above my knee, and some Scorpion blaring from my tape deck. 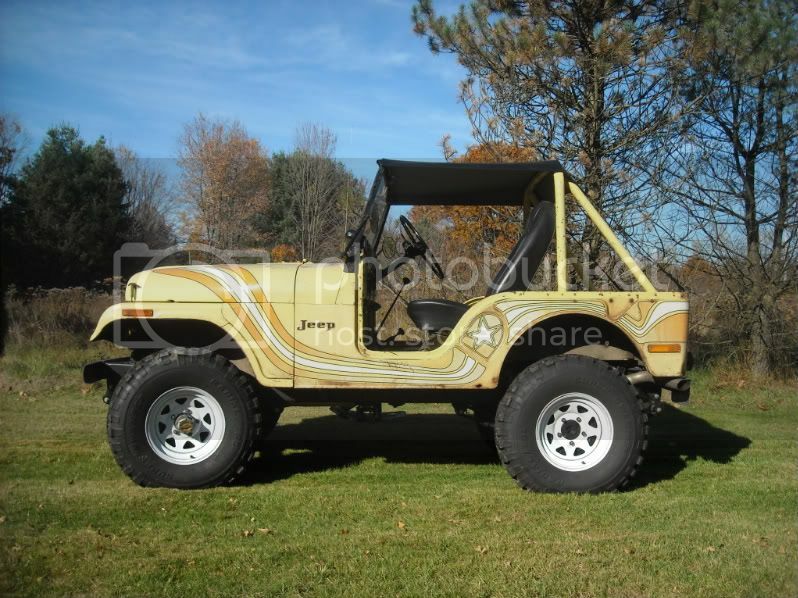 A 73 SuperJeep needs a special kind of outfit. 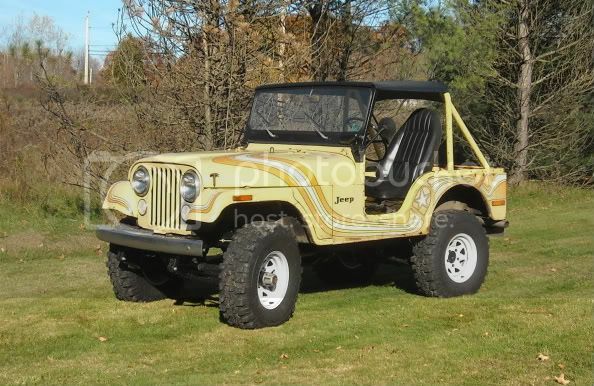 While white zipper boots and matching belt adorning poly pants and a big-collared silk shirt would certainly be period-correct, it just doesn't embody the kind of dude who would be kicking dirt in a SuperJeep. No, that fellow's long hair isn't confined to "the back deck". His freak flag flies loud and proud, parted down the middle and tied back with a filthy red bandana. He wears a faded out concert T-shirt from either Skynyrd or Waylon Jenning and a pair of jeans with slightly belled bottoms, but not crazy big like a smelly hippie. His watch is held on by a wide leather band with two buckles, strong enough to tow his Jeep if necessary. His Zippo has it's own tooled leather holster right next to his brass-bolstered Buck folder. He likes his wallets chain-driven. His radio is equally likely to play Merle Haggard's "Momma Tried" or Jefferson Airplane. His "Keep On Truckin'" hat is adorned with two pins: a yellow smiley face and a green NORML pin. He believes in peace and love enough to get along with everyone he meets but thinks if you're going to send troops you ought to let them win the damn thing. FugginJim and Hellion like this. Might as well stick with what has already been started. A couple years ago took off the body to fix some things that sorely needed fixing. Hellion and fctex like this.